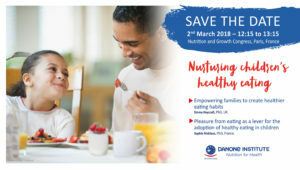 The Danone Institute International has organized a symposium during the 5th International Conference on Nutrition & Growth 2018, in Paris (France), on March 2nd, 2018. The objective of this symposium was to present the evidence and experience-based multifaceted approach for empowering families to nurture healthy eating habits among children. Discover below the abstracts and videos of the conferences. Establishing healthy eating habits in children is a key priority for parents and caregivers worldwide. Developing ways to support parents and caregivers with promoting healthy eating in their children is a global public health priority. Families and the home environment provide a vital influence on children’s eating behaviours as the family shapes both what and how children eat right from birth. While what children eat is undoubtedly important for promoting health, how children eat – and how they are fed – are crucial determinants of healthy development in childhood which are less often the focus of public health guidance. Numerous high-quality research studies have identified effective ways to empower parents to create healthier habits and to nurture healthy eating behaviours in children. These include parents adopting positive child feeding practices; families eating together; and creating a healthy home food environment. This presentation will outline and review evidence which suggests that parents’ feeding practices and beliefs can impact children’s eating behaviours. It will consider evidence for the importance of parents as healthy role models and it will discuss ways in which parents can create a home environment which supports and nurtures healthy child eating habits, focusing on the quality, availability and accessibility of foods in the home. It will draw the evidence together into a set of recommendations for best practice which can be shared with parents, caregivers and professionals. Childhood obesity, despite a recent stabilization, is still a matter of concerns in the European region and elsewhere (WHO, 2017), i.e. in France (where it concerned 17% of 3-14 y-old children in 2015; INCA3). Since many years, public health campaigns have encouraged healthy eating in many countries over the world, in particular by highlighting the beneficial effect on health of some food groups (e.g., in France “For your health, eat five fruits and vegetables a day”). However, the WHO noted in 2017 that among adolescents, “daily consumption of fruit and vegetables increased slightly between 2002 and 2014, but overall prevalence remains low ; and daily consumption of sugary soft drinks and sweets decreased noticeably between 2002 and 2014, but consumption remains high ». Clearly, there is a need for new approaches to promote healthy eating in children, with sustainable effects. Here, we propose to use pleasure from eating as a lever to encourage healthy eating. Eating is a behavior essential to survival that has to take place several times per day. It is highly driven by the search for pleasure and reinforced by pleasure. Pleasure has to be acknowledged in public health campaigns, because of its central role in orienting behavior. pleasure from cognitive representations of food. This should help to overcome challenges, such as the dilemma of nutrition versus pleasure, by putting forward the pleasure of eating healthy foods, and not only the health benefits. Valorizing the pleasure from eating healthy foods together may increase children’s choice of healthy foods. Finally promoting the enjoyment of healthy eating might help to limit the consumption of energy-dense foods. We will develop examples to show the effects of such approaches, as well as their limits.